Get mirror eyes with Chronicles of Riddick contact lenses. Find affordable mirror-effect lenses here. 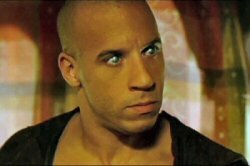 Vin Diesel's shiny eyes in the Chronicles of Riddick movie gave him perfect vision. You too can look just like Vin Diesel by popping in a pair of special effect Riddick contact lenses accompanied, of course, by a pair of sunglasses. Vin Diesel wore them in the movie as his eyes were sensitive to light but the sunglasses are perfect for a Halloween party for the pure shock factor when you take them off! At just $29.99 per lens, this Blind Out style is the cheapest mirror-effect contact lens I've found. It's only available in PLANO form and has a base curve of 8.6 and a diameter of 14.5. BUT these lenses have one big drawback - you CANNOT see through them, so only consider wearing this lens if you have plenty of friends who will guide you around the party! At $125.99 per lens, this Underworld style is a quality theatrical lens which gives a mirror-like effect. Available from Vision Direct these lenses are not cheap but the only alternative is to buy a custom made mirror lens which will cost $200 + per lens. This lens comes in both plano and prescription form with a diameter of 15.0 and a choice of base curves. NEW - Get 25% Off Your Entire Halloween Contacts Order from Vision Direct & FREE Shipping (first time customers only)! Enter coupon code NEW25VISION at checkout. Limited time offer. 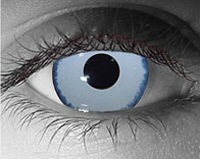 while others are the size of an ordinary soft contact lens and only cover the colored part of the eye, the iris. There are a lot of cheap Halloween contact lenses on the market but theatrical grade contacts like the ones in the picture above cost a lot more than normal colored lenses as most of the time they are made to order and the special effect is hand-painted. SFX lenses like these are thicker than ordinary contacts and they take a little while to get used to especially if you are a regular daily or bi-monthly lens wearer. For maximum safety, it's wise to only buy from FDA approved retailers and that means spending a little more - expect to pay over $100 PER lens for mirror effect lenses. Look at companies like Vision Direct who sell a wide range of special effect contact lenses including mirror effect lenses for the Riddick look and, if tempted by cheap adverts for colored cosmetic lenses, always read the small print and find out the origin of manufacture before buying. Your eyes are a precious commodity so think before you buy...would you put a cheap pair of Chinese contacts in your delicate eyes if you weren't sure they were completely safe? The range of FDA approved crazy contact lenses from Vision Direct like the examples above will help you create the look using Chronicles of Riddick contact lenses. Why not take a friend along to the fancy dress party wearing a pair of Necromancer lenses, Riddick's enemy; these change from grey through purple and then to black for a spectacular effect. NEW - Get 25% Off Your Entire Halloween Contacts Order & FREE Shipping (first time customers only)! Enter coupon code NEW25VISION at checkout. Limited time offer. Make an entrance at any fancy dress party, especially Halloween, wearing some authentic Chronicles of Riddick contact lenses. Just be sure to buy from reputable retailers to ensure your oh so delicate eyes won't come to any harm.